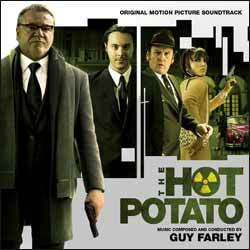 The spirit of John Barry briefly possessed the body of Guy Farley to bring us a fantastic collaboration that revisits the classic movie scores of the '60s/'70s... at least that's how it felt listening to the soundtrack of The Hot Potato. It's pretty obvious from the start that Farley is a huge fan of the music of this period, and most notably Barry. I love Barry's early work and I kept forgetting that this was a new soundtrack - I was convinced it was an old Barry score I'd somehow managed to miss. As a simple illustration of how diverse and talented Farley is, you should compare this score to his earlier work on Knife Edge (most notably the incredible 'England'). You probably couldn't get further apart stylistically and yet he pulls it off both times. There are so many fantastic themes running through this album that it's almost impossible to know where to start singing its praises. Just about every cliched sound of the period is present and correct: car chase, romantic backing music with drum brushing, but more importantly there's that familiar jazz vibe. 'The Twins' will remind James Bond fans of numerous classic Barry moments, as will 'Geiger Counter'. 'Theme from The Hot Potato' is wonderfully memorable and while having that distinct Barry-esque feel to it (mixed with a little Henry Mancini), it's certainly all Farley. This is the theme that runs throughout the album. The album lasts for 42 min, 36 sec and contains 18 tracks of pure nostalgic bliss.